Are you wondering why I packed my kids’ things up? Does it seem even more extreme that I still do it? If so, hear me out. It’s not as bad as it sounds. As we talk about having less stuff, we will be talking about having experiences together instead. I’ve created the perfect way for you to do this. Enter your email below to join in to my 30 Days to Intentional Parenting challenge to receive a simple activity to do to make memories with your kids each day. Check it out below! Success! Now check your email to grab a sweet freebie while you wait and confirm your spot in the challenge! Do you have messy kids? This one thing really can make a huge difference. Interestingly, I stumbled upon this quite by accident, but it has helped keep my whole house so much tidier and saved me a ton of time and frustration! 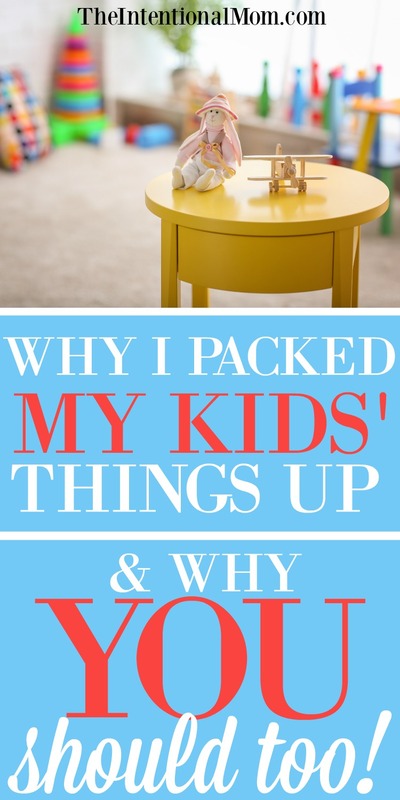 Here’s why I packed my kids’ things up and why, more importantly, I still do it! You may have heard of toy rotation. This is something I have done since my oldest kids were small, but this concept is toy rotation taken to the next level! I have teens. Two of them. Then I have a tween and a wannabe tween. It doesn’t stop there because I also have some toddlers, two of them in fact. Between teens, tweens, and toddlers, I have a recipe for a full-blown tornado nearly every day! Actually, I have seven kids altogether, which means that my house can look like a bomb has exploded in what seems to be a heartbeat. 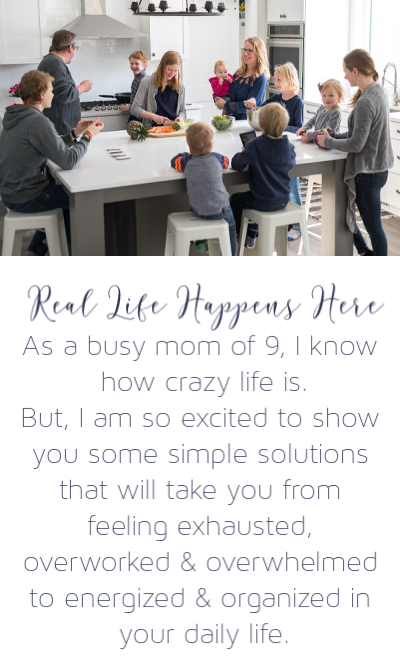 Clutter makes me crazy, it really does, which might sound funny coming from a mom of seven. 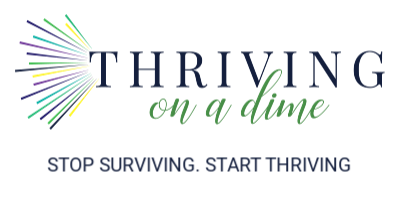 I have come up with some strategies for hiding clutter, but with so many people living in a small area, even hiding clutter isn’t always enough. So what is it that is at the root of the bomb explosion? It’s all the stuff we live with every day. Once I figured this little detail out, I knew that the solution must address all the stuff. There really is only one way to deal with this stuff, too. Are you curious to hear what it is?! You need to have less stuff. This is where the one life-changing thing comes into the picture. You need to rotate stuff. Like a lot of stuff. Do your kids have trouble with cleaning up their toys? Then pack some of them up. In a few months, rotate those toys out of the box and put new ones in. Do you have kids’ books all over the place? I love it when my kids read, and I love that all my kids are readers, however, with so many books to choose from we can have books everywhere. If this is you, too, then pack up some of your kids books to rotate out a few months later. Do you have teens who refuse to keep their clothes picked up nearly all the time? Do you have kids who repeatedly put clean clothes in the laundry to be washed simply because they don’t take care of their clean clothes? If so, this is costing you extra time and money to be washing clothes that don’t need to be washed. Sounds like it’s time to rotate out their clothes. When my kids have had issues with keeping their clothes in order and picked up, I know it is time to leave them just the right amount of clothes to get them through from one laundry day to another. In my home each person gets laundry done once a week. Therefore, each of my children only needs about nine things to get them through the week. Anything beyond that can get packed up to be rotated out later. Anything you find to be taking over your house needs to be minimized in this same way. It may sound harsh or even crazy, but if you are dealing with messy kids, they simply must have less stuff. So, why did I pack my kids’ things up, and why you should too. My kids actually enjoyed having less stuff to manage. Having less stuff to manage saves them time, and it saved me the stress of having to address it with them on an ongoing basis. In doing this we have found that we need so much less stuff than we thought we did. Doing this one thing has more clearly differentiated between a want and a need. Your kids might actually like this too. When kids have so much to choose from, they are easily overwhelmed and have no desire to do anything with any of it. With only a few toys, clothes, and other things to choose from, they appreciate what they do have so much more. Wouldn’t it be great if your kids did this too? In this way, we have been able to sell or donate numerous things. Making some extra money or blessing others through donation has been such a great reward in all of this. Try it. You just might be amazed at what your kids don’t even notice is missing. Rather than asking for “stuff” for birthdays and Christmas, they ask for experiences, outings, and simple time away with a parent or grandparent instead. It is so wonderful to share fun experiences with your kids. My kids have learned at such a young age that contentment and happiness aren’t found in what they have, rather, it is in the experiences that they share with others that they are richly blessed. Having kids who value relationships over stuff is an amazing gift for both you and your kids. Do you have messy kids? Do you have kids who have a warped sense of entitlement? Are you tired of fighting with your kids about keeping their things taken care of? Packing up their things just might be the one thing you’ve been looking for, too. « Have More Money in 10 Days or Less! I totally got rid of most of my kids clothes so that they would stop throwing it in the laundry because they didn’t want to pick it up. I have 3 boys in a room and you could never see the floor because they would pull out their clothes every time they needed an outfit and make a big mess, when really they just wanted their favorite outfits which were in the dirty laundry. So I had them pick 6 day to day shirts and 4 church shirts and 5 pairs of pants and packed the rest up. They love it!!! They don’t have to do extra laundry and they can always find their favorite things. Why did I give them so many options lol! Thanks for the tip! I know! Once you do it, you wonder why it took you so long! I’m glad it’s worked well for you! If I could repin this or share this a million times I would! I want this for my kids so bad. In fact, I made a list of the clutter spots I want to fix before reading this. I even told my husband I am at the point of wanting to literally get rid of everyone’s stuff and letting them earn a few things back as they show responsibility! My husband built our house so all the kids have their own room, but they’re never in it! We’re usually all together, so I’ve also considered having my 12yr old stepdaughter and 4 yr old daughter share a room, stepson has to have his own, and the twins will share. The extra room could be a homeschool room and more usable! It is such a struggle with too much stuff and space that gets filled with stuff. I think our family needs a perspective change. This post is awesome and motivating! Sorry for long response ? Thank you! It is amazing how easily our stuff can get out of control. My kids love sharing rooms, and they do it by choice. I actually have an extra bedroom simply because my kids want to share rooms! Let me know if you start implementing some of these ideas. I would love to hear how it is going for you!